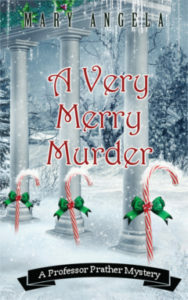 A Very Merry Murder ($15.95, 258 pages, 5×8 Trade Paperback, ISBN: 978-1-60381-655-7), by Mary Angela, is the third book in the Professor Prather Mystery Series. Professor Emmeline Prather’s lectures on Agatha Christie become all too relevant when a murder takes place at the local inn and suspicion lands on her. “This book overflows with the sounds and smells and music of the winter holiday season. It’s December in Copper Bluff, and from hillside to hallowed hall, everyone is merry–or will be as soon as semester break arrives. Students are studying, professors are grading, and Emmeline Prather is anticipating the university-sponsored holiday concert. Friend and colleague Lenny Jenkins will be accompanying the visiting quartet, Jazz Underground, and Em can’t think of a better way to kick-start the holiday season. When Emmeline starts to see parallels between an Agatha Christie novel she’s teaching and the victim, Lenny claims she’s read one too many mysteries. But as the clues unravel, so does the murderer’s patience. Em is close to finding the truth, but will the truth–or the murderer–push her over the edge? It will take a Christmas miracle to solve this case, but if there’s one thing in surplus this time of year, it’s faith. Book Three of the Professor Prather Mystery Series. Mary Angela, like her protagonist, lives on the Great Plains and teaches college writing and literature. When she’s not grading papers (when is she not grading papers? ), she enjoys reading, traveling, and spending time with her family. She and her husband have two amazing daughters, one adorable dog, and a cat who would rather not be limited by an adjective. For more information, go here. Around the department were other nods to the holidays, such as a small tree placed on the table outside Barb’s office. Someone had taken the time to wrap the old books in brown paper, tying colorful ribbons around each one. Across from Barb’s office was Lenny’s, and he’d taped a paper menorah to his door. On my door were jingle bells that chimed noisily as I turned the key. The faint smell of pine cleaner greeted me as I entered the tiny room. Although small, my office contained my most beloved possessions: old books and papers and a black push-button phone dating back to the 1970s. I don’t know when I’d become so nostalgic, before the move to Copper Bluff or after. My degree, French literature, inclined me toward historical texts and papers. Despite my attachment to the past, a new laptop computer sat on my wooden desk, looking silver and futuristic among all the brown and antique. I’d purchased it last spring and loved its mobility and efficiency too. It took up half the space of my old desktop and was small enough to fit into my satchel. I unwrapped my scarf and hung it on the hook by my door along with my coat. Our faculty meeting wasn’t for twenty minutes, so I had time to check my inbox. The last month of the year brought a digital deluge with it. Students who had been lackadaisical about their grades for fourteen weeks suddenly turned into diligent scholars. They finally cared about points, participation, and all the things I’d tried to hammer into their heads from the first day of fall. Extra credit was their last hope, and they wondered what events they could attend and where. There was no venue or task they wouldn’t consider if it meant ten extra points. I huffed as I scanned twelve new emails. If only they had shown such enthusiasm weeks ago. “Em, you’re here,” came a voice from the doorway. I turned to see Claudia Swift, a creative writing professor and very dear friend. She wore a green blouse, gold scarf, and boots with four-inch heels. “I have something for you.” She pulled out a package from her sheer, billowing sleeves. “Claudia! It’s so early. I don’t have yours wrapped.” The truth was I didn’t even have it purchased. Claudia and her husband, Gene, had gone on a couples’ cruise to Italy last spring to rekindle their on-again/off-again relationship while their two children stayed behind with grandparents. A tenured professor, she was able to get away with a semester-long sabbatical, which had been a success on many levels. One, she and her husband renewed their marriage vows in romantic Venice, and two, she had written fifteen poems, some of which were accepted for publication. It would be years before I would feel as secure as she did in her position. Yet during my pre-tenure review in the fall, Giles assured me I was on track for associate professor in three years and accepted my first proposed course, which was heavily enrolled. All around, it had been a good semester.